If the downward-spiralling Pirates of the Caribbean film franchise taught us anything, there is still plenty of interest in pirates, the 18th century sailors who plundered Spanish galleons and went marauding across the seven seas doing marauding and pirating and stuff like that. The target of many of the pirates was gold coming from the New World to Europe, and it's this period of history that Gamesys have "plundered" themselves in their 5-reel slot, Pirate's Plunder. Fear not, I'm not about to share with you the vast maritime history of the Pirates of Penzance. 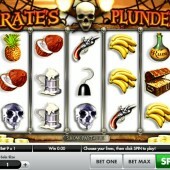 However, it is easy to see how pirates are such a popular theme for online slots with their swashbuckling stories and hardy reputations across the high seas. At first glance, the game is nothing new if you've played Play'n Go's Jolly Roger or NetEnt's much slicker 3D offering, Ghost Pirates. In terms of symbols, it's all yo-ho-ho and a bottle of rum, or in this case, yo-ho-ho and a bottle of rum and a flagon of ale, a coconut, pineapple and bunch of bananas (in case you forgot we were in the Caribbean), a pair of cutlasses, a gold-laden treasure chest and a hooked prosthetic limb that looks like it has a very infamous owner. Making up the reels are a ship's wheel, a jewel-encrusted cross, a crystal skull and a pistol. Get Your Hooks On a 10,000 Coin Jackpot! The Skull n' Crossbones flag is the game's Wild and doubles any winning combo it helps form. The Wild substitutes for all regular symbols other than the Scatters, and five Wilds pays a 10,000-coin jackpot. 20 free spins can be won if you hit two or more Scattered Ship's Wheels anywhere on the reels. There's no multiplier involved, but with only the two Scatters needed to trigger the round it can prove a regular, lucrative feature to hit. It's worth bearing in mind that two Scatters will bag you just 2 spins, but the more Scatters you hit the more spins you win. 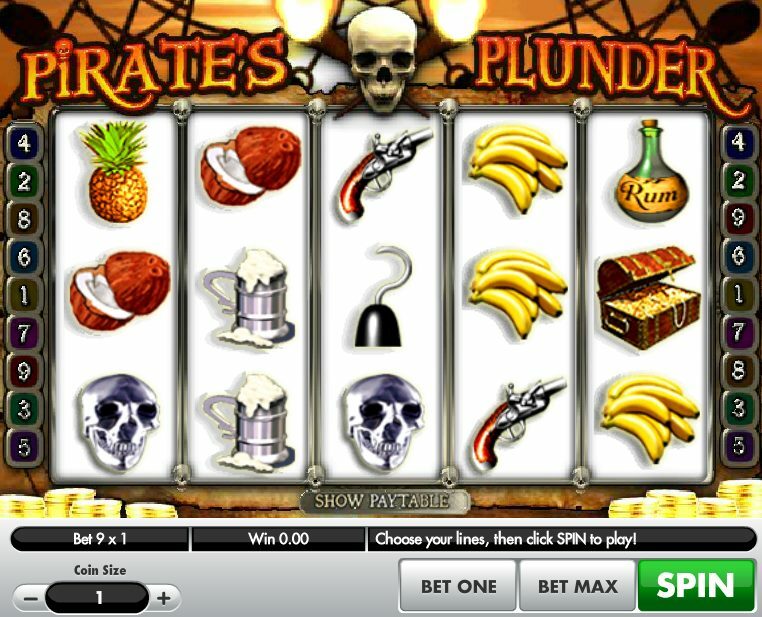 Pirate's Plunder is that weird game where you are chasing lots of small wins across 9 pay-lines and hoping to hit the free spins regularly. It's therefore a good idea to play at the top coin ($1.00) as much as possible to take advantage. So, overall a simple game but pirate fans may want to check out the alternatives instead.